How often has your machine been shut down by a power cut or a mains spike? Sod's Law dictates that it's always right in the middle of something important - like when you're top of the Counter-Strike table, or you're about to finish burning a DVD of all your crucial stuff. The solution to this is a UPS - uninterruptible power supply - which charges off the mains and basically acts as a massive battery for your system in the event of mains failure. 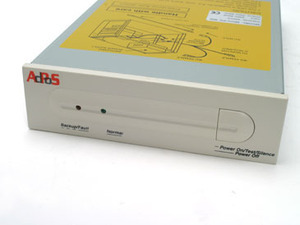 In the best case scenario, a UPS will be needed for 30 seconds or so whilst the mains power starts back up again in the event of a spike. Worst case scenario, the UPS can keep your machine on for 10 minutes or so in the event of a longer outage, giving you the chance to shut down properly without losing any work. 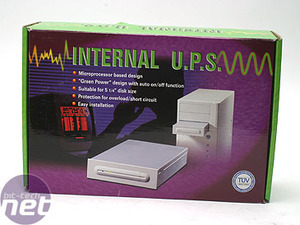 Of course, the problem with UPS systems is that they are usually massive and expensive. This new module, however, is neither. Costing around £95 and fitting into a spare drive bay, it is not only useful but portable, meaning that your PC can be protected from mains failures at LAN events too. The unit is fairly plain, and will require a bit of modding to fit in with the average aluminium faceplate. It has a multi-function button that serves as both on/off and test. 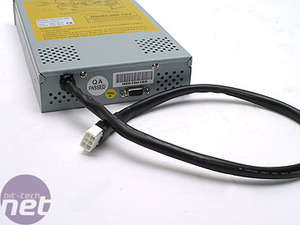 The rear of the unit is linked to a backplate which hooks up to your power supply. You get all the cables and instructions that you need to get started. 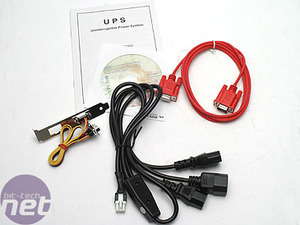 To hook up the UPS, you need to connect your mains power cable to the UPS, then loop that through to the PC. There's also one for your monitor, to keep that on too - a computer without a monitor isn't much use! 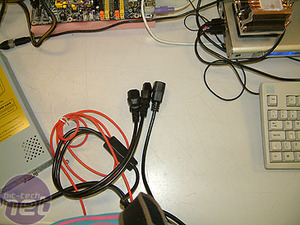 There is a serial cable that hooks up to the main unit to control the 'intelligence' that will report the status of the unit. Before you get started, you'll need to charge up the unit for 24 hours to give it full capacity. 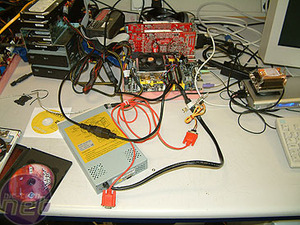 We duly did so, and connected the UPS to one of our graphics test rigs, which sported some majorly high-power components such as X1900 CrossFire, 2GB of memory and an FX-60. The test was obvious - once we disconnect the power, how long can the machine stay on for? We found that the UPS was able to supply power to our rig for 6 minutes, and tests on other (more moderate) rigs suggested that 10 minutes was about average. This is plenty of time to avoid a spike, and also plenty of time to finish off your work and shut down cleanly, without having your machine just power off. Overall, this is a really decent product that does exactly what it says it should. It's a great form factor, and would make a great addition to anyone's LAN-going machine, where power is not exactly well-regulated.